A trek down the Intracoastal Waterway would not be complete without a southern dose of hospitality at Elizabeth City, NC. 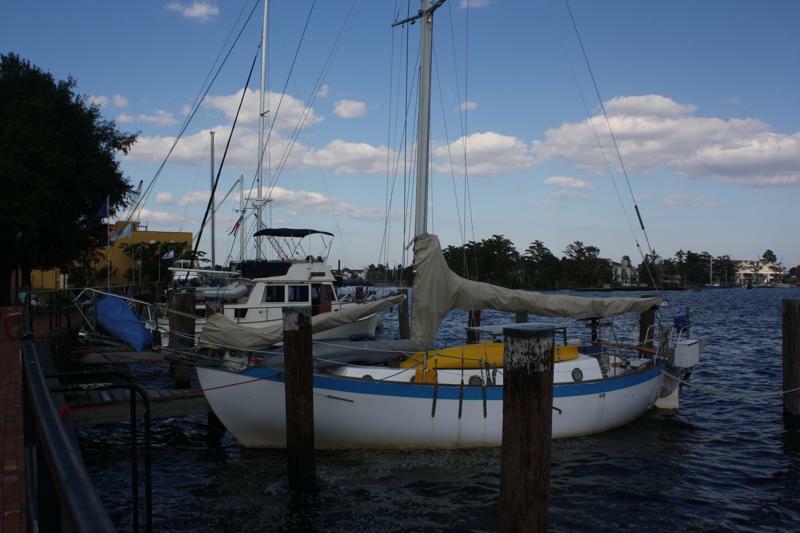 Here boats can dock in free slips along the town’s waterfront at Mariners’ Wharf Park. The slips offer free wifi, free trash disposal, and if you take a close look at the nearby water fountain you might also top off your tanks for free. Stop in at the Visitors’ Center for a map of town and a list of hot spots. If you’ve got some errands to run, the Visitors’ Center also provides free bicycles; a bicycle would make for an easy trip to the nearby Food Lion, Ace Hardware, or the laundromat. And if the previous five uses of the word “free” were’t enough to get your attention, you might be interested in the free and fabulous Museum of the Albermarle or the free and lovely Arts of the Albermarle gallery. Finally services and entertainment within our price range! During our full day in Elizabeth City Brian and I started our morning by completing a boat project; all the while talking with neighbors and pausing to handle lines for arriving or departing vessels. The boat project was not planned. When docking along the wall in the South Mills Lock the bow was out just a tad too far and we bumped the stern rail against the wall. The stern hit the wall smack on a scupper pipe and pushed it loose. So Brian had a nice, little fiberglassing job to repair the scupper so that it wouldn’t leak onto our navigation station. Once glassed we took to the streets. 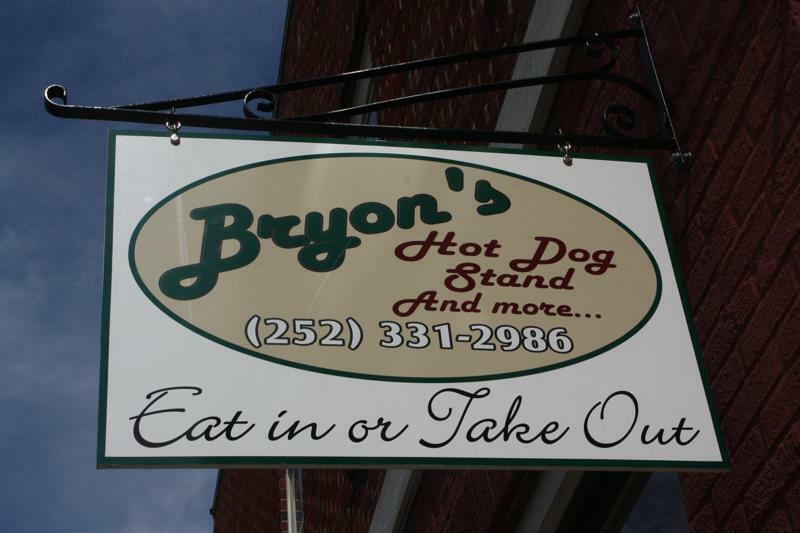 Check out Bryan’s Hot Dog Stand for a tasty $1 hot dog. Bryan’s also has a sandwich menu and homemade desserts. 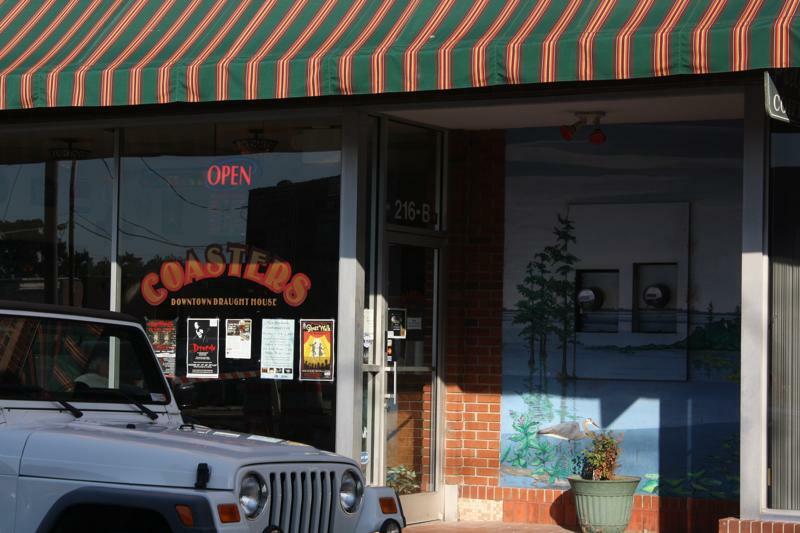 At Coasters you’ll find the best tap selection in town of local microbrews. Coasters was hoppin! This year, Brian and I were fortunate to be invited to a Rose Buddies wine and cheese welcoming party. 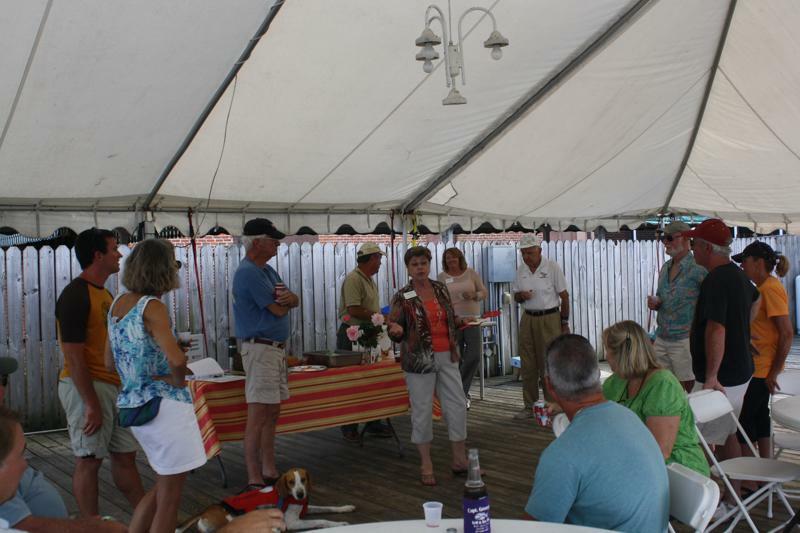 This was a fantastic way to mingle with our dock mates and learn more about Elizabeth City. In 1983 Joe Kramer and Fred Fearing started this tradition when they drove Fred’s golf cart along the docks equipped with wine, cheese, and freshly cut roses from Joe’s yard. The friends visited the boats docked at Mariners’ Wharf sharing refreshments and giving a rose to each of the First Mates. After Joe’s passing, his rose bush was transplanted at Mariners’ Wharf Park. Fred continued the tradition for several more years, well into his 90’s. Today, volunteer “Rose Buddies” keep the tradition alive. 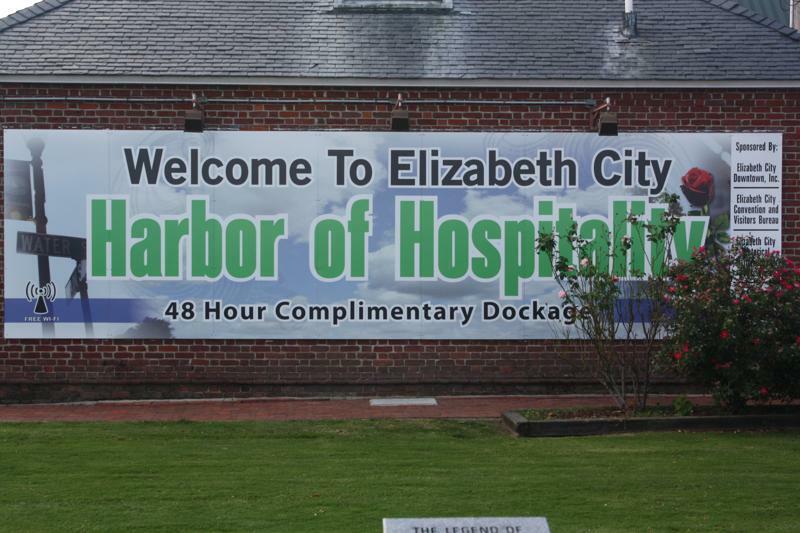 Thanks, Elizabeth City and the Rose Buddies for a fabulous visit to your Harbor of Hospitality! 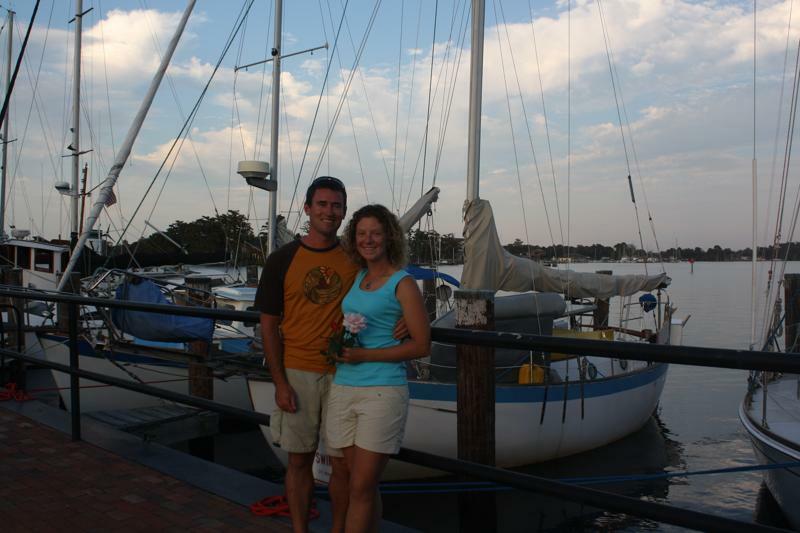 This entry was posted in Uncategorized and tagged Elizabeth City, free dock, free slips, harbor of hospitality, ICW, Intracoastal waterway, museum of the Albemarle, rose buddies by stephanie. Bookmark the permalink. You and Brian are one of my most favorite memories from our first journey on the water. You guys amaze me. I think of you all the time; where are you, how are you, are you baking on the boat or what project is Brian working on. I just loved that our paths crossed. Forever, you guys will be an inspiration to me that it is possible. It is all possible!